First off, please allow me just say how much I wish I were Deborah Treisman. Not even so much because she has the enviable job of fiction editor at The New Yorker magazine; if under some bizarre circumstances I were chosen to replace her -- circumstances such as, say, a mysterious orange cloud that removed her and all viable candidates for the job to a prison with no telephone or internet access or chance of escape -- then I would surely steward the magazine's fiction section into ruin. And I don't want that. Rather, I'd like to be Deborah Treisman because of her knowledge of and feel for literature, and maybe also because of her lovely voice, which she uses on The New Yorker fiction podcast (link opens the podcast in iTunes). In each episode of the podcast, a fiction writer who has been published in the magazine selects and reads another writer's story published in the magazine, and discusses it with Deborah Treisman. 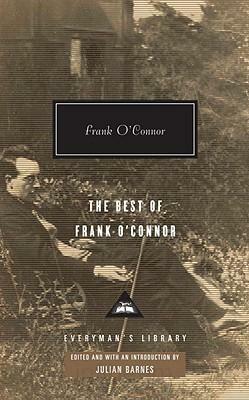 Julian Barnes, who edited and wrote an introduction for "The Best of Frank O'Connor," says in the podcast that we can move from the high view from which the two boys in the story spy on the neighbors, to the high view we as readers have on characters in a story, to O'Connor's view as a writer -- "also writing from a height," says Barnes, "not in a sense that implies condescension, but that implies a better view, and also a view of people when they don't know you're watching." A view from on high is of course just one perspective that a writer or reader may assume in a story. Characters may be seen from a close perspective, face to face, or from the inside, or from across a room, through a peephole, or perhaps from another plane of existence, as if seen by a ghost or a god. Whatever the perspective, what Julian Barnes identifies as "a view of people when they don't know you're watching" is perhaps most intimate. Characters in a story, however, are often watched by other characters in the story, and this may affect their behavior. But so long as they don't know that they are being watched by their creator, the writer, or the minions of readers, maybe they will act more unselfconsciously. Or about as unselfconsciously as a person of faith behaves, believing she is being watched by her creator. Somewhere in here there is a thesis that takes a sociological perspective on literary criticism -- Erving Goffman's "The Presentation of Self in Everyday Life" as applied to stories. Goffman uses the metaphor of theater to say that we are all performers, we perform our selves to different audiences. The big question is, is there an authentic self apart from the selves we choose to perform to those around us? We may reverse his metaphor, and instead of understanding the sociology of everyday life through the metaphor of theater, we look at fiction through the prism of the sociology of everyday life. This equation presumes that a character can exist apart from her writer-creator. But that is a post for another day.